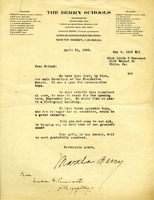 Annie L. Vickery writes Martha Berry to send a donation of $20 to help with rebuilding the boy's dormitory that burned down. 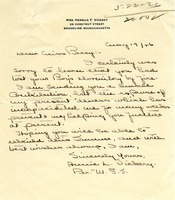 She also informs Martha Berry of her own illness, which has incapacitated her for many weeks. 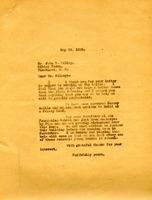 Letter announces the loss of a seventy-five bed boys dormitory by fire. 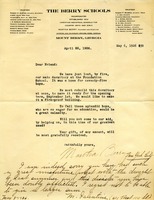 It asks for the friends' support in rebuilding the dormitory with a fire-proof building. 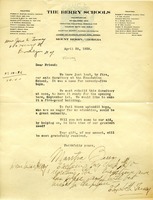 Mr. Stark writes to Martha with a check to aid with the rebuilding of the building lost by fire and hopes that he will be able to provide more a little bit later. 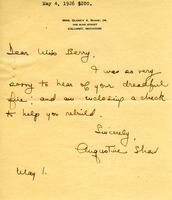 Martha writes to Mr. Sibley to thank him for the heifer he had written about and informs him about the dorm fire. 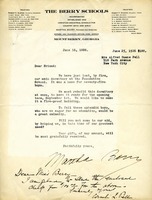 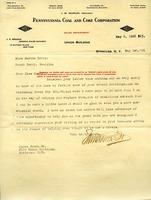 This letter is written on an appeal letter sent out by Martha Berry. 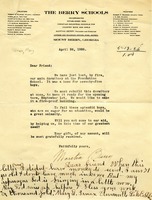 In the letter Mrs. Pell send one hundred dollars towards the building of a new boys dormitory. 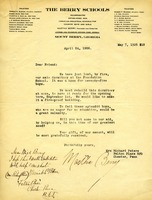 Letter announces the loss of the main dormitory at The Foundation School to fire, and pleads for donations for a replacement fire-proof building; recipient of this letter sent $10. 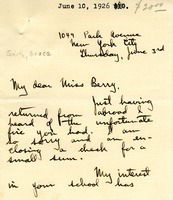 Miss Smith writes to Martha with a small donation after returning from being abroad. 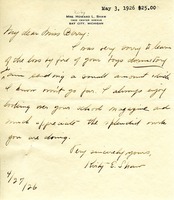 Mrs. Shaw writes to Martha sorry to hear of the loss of the boys dorm to fire, and sends a donation to help with the building repairs. 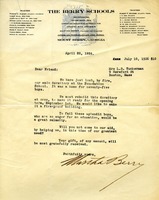 Martha Berry asks for donations to help rebuild the dormitory that burned down.